We cannot be his disciple unless we deny ourselves of things we want. If we give in to our every desire, we become slaves of our desires. The only way we can reach spiritual maturity is with great discipline. First, we must have a discipline of prayer. So many times we have heard people say they don’t have time to pray; or they may say they don’t want to bother God with the small stuff. What is it that we think we can do without God’s help? It is His love that sustains us and keeps us in existence. Prayer is not just asking God for what we need; prayer is also thanksgiving for all God has given us. Prayer is also about adoration, worship and praise. Prayer is our connection to Almighty God who is our Father and wants to have a personal relationship with us. It is especially in our prayer that God gives us insights that help us to discover His great plan for us. A possible prayer routine would be to begin our day with prayer, pray before meals, pray when you get in your car, pray whenever you begin a new task or before you have a meeting or before entering into a conversation. Of course we have the divine office, the rosary and other devotions we are familiar with. We should pray at night before sleep; examining our conscience to reflect on how well we did as a disciple of Jesus. It is especially important to pray every day with your spouse and children. The most important gift that parents can give their children, is that the children know without a doubt that their parents love each other, their parents love them, and their parents love God. It has been said that ‘no prayer means no faith.’ In other words, the measure of our faith is our commitment to prayer. If we want to deepen our faith we must pray more, read the Scriptures, read the lives of the saints, know what the Church teaches and why; and especially spend time with Jesus in the Blessed Sacrament. If we want to follow Jesus, we must spend time with him, just as we would with people we love. Jesus says we must deny ourselves and take up our cross. We all are going to have crosses to carry throughout our lives; they could be physical, financial, relational or any other difficulty. If we are going to carry these crosses with Jesus’ help we must turn to him. Our temptation when we are undergoing a trial is to escape for a time through alcohol, drugs, work, immoral relationships or by being impatient or rude with the people we love. Some people even become impatient with God if their prayers aren’t answered right away and they turn to card readers, astrology or other superstitions. Another temptation is to keep looking at our cross, whatever it is, and in our imagination it becomes bigger than reality, and we believe it is too heavy to carry. When we undergo trials we should first of all look at Jesus on the cross and remember his promise. He said, “Come to me all you who labor and are burdened and I will give you rest, for my yoke is easy and my burden light.” If we pray and keep our eyes on Jesus, he will help us moment by moment to carry our cross; it’s his promise. No matter how bad we have it on our worst day, there will always be someone who has it much worse and is still joyful because of their relationship with Jesus. Again, read the lives of the saints to see how God worked in the lives of those who loved him in a heroic way. Those who are the happiest in this life and for all eternity are the faithful disciples of Jesus. Jesus promised an abundant life for those who followed him. He didn’t say it would be an easy life. He said, “…whoever loses his life for my sake will find it.” In other words, the only way we can reach our potential for happiness is in relationship with him and the help of his grace that he makes available to us through the Church he founded and through her sacraments; especially reconciliation and the Eucharist. In this holy sacrament of the Eucharist, he gives us himself—body, blood, soul and divinity— so that we might be transformed into his faithful disciples, if we are willing to die to ourselves, take up our cross and follow him. Although this message was directed to young people in Madrid; that same message is for everyone. Whatever age we are, we can build our lives on a strong foundation with faith and centered on the Truth. Then, we can stand firmly on this foundation of hope and help others by inviting them to encounter Christ. This hope ‘pushes’ us to grow in holiness—to a deeper relationship with Jesus. When my brothers’ children expressed concern about their choices or future, we encouraged them to build a foundation of faith and prayer, good virtues, and role models. If they make wrong decisions in their lives and ‘fall,’ they fall on that solid foundation (and not through any cracks of the foundation)! Then, with prayer, charity and God’s mercy through His Sacraments, they can stand again. The vocation to love is what makes the person an authentic image of God. One becomes similar to God to the degree that one becomes one who loves. Tom and I began the Pilgrim Center of Hope to be a center of evangelization. Evangelization is born in the love and joy that comes from the discovery of Christ in your life, rooting your life in Him, and then sharing your happiness with others. And so I say to you, you are Peter, and upon this rock I will build my Church, and the gates of the netherworld shall not prevail against it. I will give you the keys to the kingdom of heaven. Whatever you bind on earth shall be bound in heaven; and whatever you loose on earth shall be loosed in heaven. Jesus has passed his authority on to Peter and the Church; the purpose of this authority is to save souls for eternal life. The wisdom and authority of God are frequently in conflict with the wisdom and authority of the world which often seeks power, pleasure and intellectual superiority. Our lives are shaped by the authority we choose to influence our decisions. Is our primary purpose in life the salvation of our souls and the souls of the people we love? If so, let us follow the authority of the Church which has been commissioned to save souls. What’s the state of our young Catholics? Aren’t today’s young people incapable of embracing Catholicism? Rather than attend Sunday Mass, they’d prefer sleeping in after a rambunctious night of Saturday debauchery. On voting days, they opt for abortion, gay marriage, and then proceed to the nearest drug store for their regular contraceptive purchases. The Catholic Church is run by old, celibate men who are irrelevant to contemporary youth. Well, the world would have you believe all of that. A couple of days ago, Pope Benedict XVI quickly passed through a Madrid street in his ‘Popemobile’ for a few seconds, and a crowd of young pilgrims was there. How did they react? Don’t let anyone tell you the youth aren’t excited by Catholicism. The Fisherman’s Ring bestowed to Benedict XVI as the 265th Vicar of Christ is named after the first Pope, Peter the Fisherman. Peter met Christ by the Sea of Galilee while he was carrying on his daily work as a fisherman. The Sea of Galilee is the largest freshwater lake in the Holy Land, approximately 13 miles long and 8 miles wide. There is an outlet from the southern part that flows into the Dead Sea. It’s still there! A Franciscan Friar living in the Holy Land said “The Sea of Galilee can be considered a sacramental, it is blessed because our Lord sanctified it with His Presence.” Imagine walking along the shore of Galilee where Jesus walked and called out to fishermen who later became his Apostles and fishers of men! Jesus told them “Come after me and I will make you fishers of men.” (Mark 1:17). Now think about walking along the shore of Galilee today. When we go on a Holy Land pilgrimage, we invite the pilgrims to take a walk along the shore of Galilee in total silence, meditating on the Scripture stories about Jesus in Galilee. For many pilgrims, they are surprised by the Gospel….the Scriptures come alive for them walking in the area where they occurred. And they encounter Christ in a personal way. There is a shore of the sea of galilee where you are…a quiet place to take time to “walk with Jesus in silence” as you meditate on the Scriptures. There you can encounter Him by prayerfully reading the Gospels and responding to His call – “Come after me….”. When we meet the Living God in Christ we know what life is! Ever wondered about Mary’s home in Nazareth? 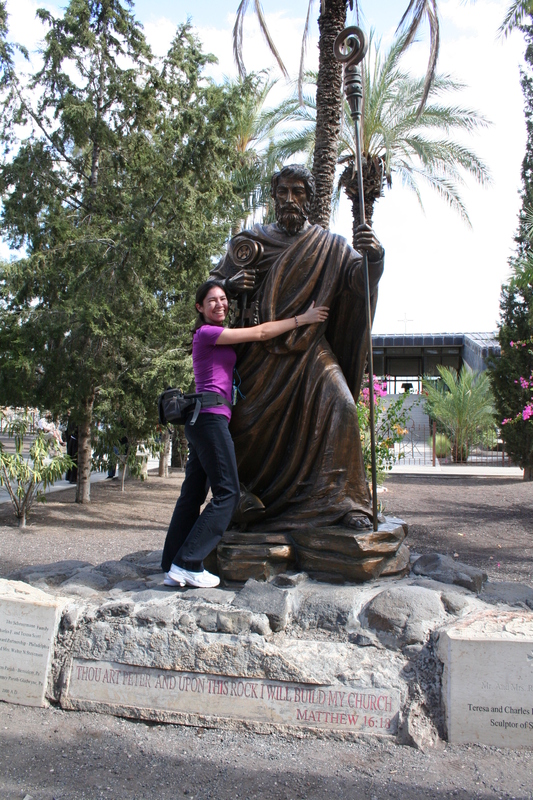 Ancient Nazareth is located in the Galilee area. At the time of Jesus, Nazareth consisted of a small population, perhaps around 200 . The religious order of Franciscans excavated the area in 1736, and since then, have been the custodians of this holy site known throughout the world as the hometown of the Holy Family. Today, a large Catholic church is built over most of ancient Nazareth: the Basilica of the Annunciation. As we enter the church’s plaza, the facade of the Church building has the Hail Mary etched in Latin. Along the walls, several images of the Virgin Mary are displayed, donated by various countries. The main entrance has a bronze door with scenes from the life of Christ. There are two levels in the Church. The lower is where we find the home of Mary as you see in the photo. The altar has a Latin inscription that reads: “Here the Word was made flesh.” It is interesting to note that the Latin word “HIC” for HERE is the first word of this proclamation of faith! 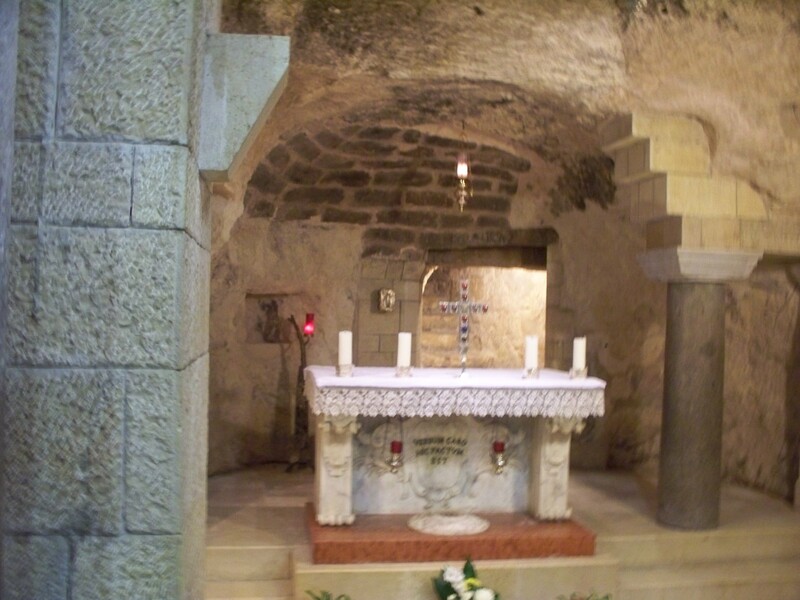 Our pilgrim groups have Mass in front of this humble place where the Archangel Gabriel visited Mary and announced that she was to conceive by the power of the Holy Spirit (Luke 1:26-38). The upper level of the Basilica shows various images of our Lady, including Our Lady of Guadalupe. The main sanctuary has a beautiful mosaic of Old & New Testament figures: from Moses and the prophets, to Jesus, Mary and the saints—giving the viewer a “glance” of the history of the Catholic Church! This level is also where the local Catholic community worships every Sunday and where John Paul II celebrated Mass during his visit in 2000. A visit to the Basilica to the Annunciation offers the pilgrim 2,000 years of history! A visit to this humble home of Mary reminds us of her humility and of her great faith in God! We can visit with Mary now, in prayer. A great way to visit with Mary is by praying the Rosary and meditating on the life of Jesus. John Paul II said, “Praying the Rosary is contemplating the face of Jesus with Mary.” Pray the rosary; let this “spiritual tool” build your relationship with Jesus and His Mother, Mary! For a complimentary Rosary and pamphlet on how to pray the Rosary, contact us! We know that Jesus is the merciful Messiah, why did he apparently insult this woman? There is purpose to every thing Jesus does. He has already seen her great need and humility and can use this opportunity to teach those with him the importance of deep faith and trust. This reading challenges us to reflect on how well we handle insults. Can we forgive and move on, or do we harbor a grudge and become bitter? 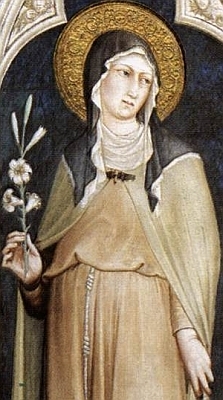 Clare’s name means “shining in name, more shining in life.” Born in the town of Assisi about the year 1193, Claire was 18 years old when she heard St. Francis preach during the Season of Lent in one of the Churches in Assisi, which influenced her life forever. Soon after, she left her family and home to the chapel of the Portiuncula where Francis was living with his small community. She wanted to follow Christ as Francis; simple, poor and filled with joy! Changing from her rich clothes to a simple tunic and cutting her long hair, Clare left everything to live a humble life. At 22, Francis appointed Clare as head (superior) of a community and gave her his rule of life to live by. Soon after, her mother, sister and 14 other women joined this small, humble community of prayer. This community became the “Poor Clares”; they went barefoot, slept on the ground, fasted, prayed and did acts of charity. Clare loved the Lord Jesus and spent hours meditating on His Passion. She died in her convent in Assisi of natural causes at 60 years of age. Her body is incorrupt and can be seen today in the Basilica of St. Clare in Assisi, Italy. When we were in Assisi on pilgrimage, we encountered St. Clare—and of course St. Francis—by visiting the two Basilicas named after them. The Basilica of St. Clare has her body, iconography depicting scenes from her life, personal items, including her hair placed in a container (called a “reliquary”). She loved St. Francis; not only was he a close friend, he was her spiritual director. She loved him so much because he introduced her to Jesus. Is there someone in your life that has led you closer to Christ? If so, thank them! Invoke St. Clare’s intercession for them and for yourself, to continue your daily walk with Jesus! St. Clare, pray for us! THIRD CENTURY, A.D. — Saint Lawrence was one of seven deacons who were in charge of giving help to the poor and the needy. When a persecution broke out, Pope St. Sixtus was condemned to death. As he was led to execution, Lawrence followed him weeping, “Father, where are you going without your deacon?” he said. Full of joy, Lawrence gave to the poor the rest of the money he had on hand and even sold expensive vessels to have more to give away. The Prefect of Rome, a greedy pagan, thought the Church had a great fortune hidden away. So he ordered Lawrence to bring the Church’s treasure to him. The Saint said he would, in three days. Then he went through the city and gathered together all the poor and sick people supported by the Church. In great anger, the Prefect condemned Lawrence to a slow, cruel death. The Saint was tied on top of an iron grill over a slow fire that roasted his flesh little by little, but Lawrence was burning with so much love of God that he almost did not feel the flames. In fact, God gave him so much strength and joy that he even joked. Then he prayed that the city of Rome might be converted to Jesus and that the Catholic Faith might spread all over the world. After that, he went to receive the martyr’s reward. Saint Lawrence’s feast day is August 10th.